The terms: glider or sailplane? Gliding or soaring? The terms glider and sailplane are interchangeable but sailplane is more common in the USA. Gliding is a forward movement whereas soaring results from/in climbing, sometimes to very great heights or just enough height to progress forward to the next climb to proceed across country. For everyday purposes, there are several ways of launching gliders but for competitions, the most usual is by aerotow, attached by cable to a powered aircraft. There is a release mechanism at both ends for safety but usually the glider pilot will release from the towplane (or tug) at a pre-determined height, often 600m, or once sufficient height has been gained to make staying aloft (and/or climbing further while awaiting the opening of the contest) feasible or where very strong conditions can be exploited for the same purpose. In marginal conditions, returning to the airfield before the start is allowed with 2 further attempts permitted but landing outside the contest zone pre-starts will result in grounding for the day and so, zero points. The motive force in gliding and soaring comes entirely from judicious exploitation of natural phenomena, rising columns of warmed air, ridge and wave lift but some competition gliders do now carry small engines which usually retract into the fuselage behind the cockpit. Self-launchers can take-off like an aeroplane without outside help of any kind, very useful for speeding up launching on a busy airfield and also for lifting off to fly home from a landing field too small for a tow-plane to use. The engine must be switched off and retracted once a suitable height has been achieved and before starting the task and if started up again during flight, for example once conditions are no longer strong enough to permit a return to base, is recorded as the “virtual landing” or end of the contest day, from which point the day’s score will be calculated. 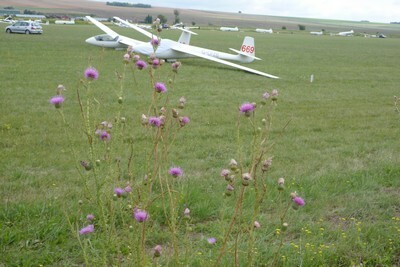 Self-sustaining engines are not used for launching but can be used to keep a glider airborne so that a field landing is avoided. In the same way, starting the engine marks the end point of the day’s competition task but allows a pilot to fly home and so avoids the fatigue and risk of damage associated with a field landing and the subsequent wait for a crew to arrive, dismantle the glider and transport it back by road. Although there are now competition classes for “multi-seater” gliders, which at the present state of evolution means two-seaters, gliders with one seat behind the other and which may also be flown solo, gliding is still a sport of individual endeavour so a national team consists of individuals (or pairs in one glider) competing in a competition class for individual honours. The class system has evolved from three basic categories, based on wingspan. 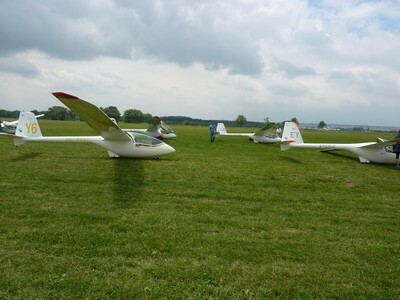 These were and remain the Standard and 15metre classes, both with the same tip to tip spread but Standard class gliders have no flaps, while the 15m Class, (formerly Racing Class) gliders have them. The third traditional class is the Open Class embracing a variety of “big wings”. All have ballast tanks for jettisonable water, to enhance performance in certain conditions. Additional classes have been authorized by the FAI Gliding Commission (IGC) as new designs emerge and sufficient demand is proven. But, as producing gliders from idea to first competition flight is a very long process, not to mention investment, IGC needs to plan some years ahead of offering a first championship in any new class. National, European, Continental and World Championships in any one class have exactly the same value but may take place at different venues. With the number of classes and participants now exceeding what can safely be accommodated on one airfield, there are now 2 locations used in a European (odd years) and World (even years) championship year, taking three, or a maximum 4, classes each. 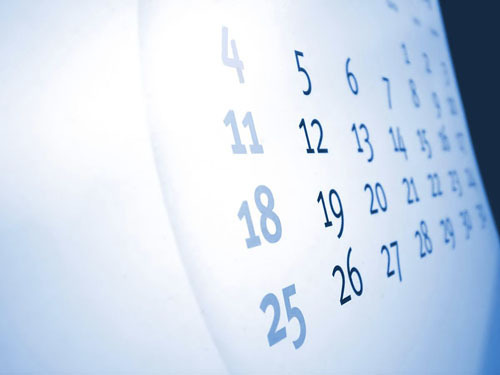 For example, 2012 sees the 15m, 18m and Open classes competing in Uvalde, Texas, USA (see the Events Calendar page)and the Club, Standard and World events in Argentina (unusually, held over to Jan 2013 for the southern hemisphere summer). Women’s and Junior championships, having smaller entries, take place with selected classes at one site. In most cases, a nation may enter 2 pilots per class with reserves plus any reigning Champion. Women and Junior pilots can and, of course do, compete in any event but have their own dedicated major championships, with three pilots per nation permitted to encourage participation, as both stepping stone and impetus for these two groups. The Club Class arose to provide international level competition in club-type gliders for the large number of talented pilots who could not aspire to owning an expensive modern glider of their own. It has kept demand high for a number of older but still very valid designs. Using a variety of types, this class is handicapped according to a handicap list based on each machine’s known performance and no ballast is permitted on board. This class is extremely popular and is frequently oversubscribed. With costs rising everywhere, IGC held a competition in the 1990s to design a machine that would cost no more than half the price of an average family car. The chosen design was the Polish-built PW5 “Smyk” and as it had been hoped to produce and sell it worldwide, the mono-type competition class created for it was named the “World Class”. The new 13.5m class includes the World Class design as one type which complies with the specifications of the new class. Humans being by nature competitive, it wasn’t long after discovering how to fly gliders that pilots started testing themselves against one another. Early contests were, however, limited by the rudimentary nature of the craft, the science of soaring yet to be discovered by and of course, our old friend/enemy, the weather. Tales are still told of the famous “downwind dash”, where gliders flew as far as the tailwind could push them while daylight lasted. Lots of fun, I am told, but retrieves so long that some were not back in time to fly again next day, not to mention the exhaustion of the crews who had to go after them. So, a multi-point course, most often the now classic triangle, proved to be a better idea, since those who completed the task landed back at base. Scoring was complicated, though, by the outlanders (pilots who, unable to make it back to base, have chosen to make a safe landing on another airfield or some other available piece of land, usually a farm field) so a formula had to be created which gave finishers points for speed while those who didn’t make it home were awarded points for the distance achieved. In some contests, scores were made up a combination of speed and distance points. International Championships are run all over the world. Pilots selected on the basis of their results in competitions at home can enter biennial European Gliding Championships which alternate with World Championships. In an EGC year, there are also separate World Championships for Junior pilots, up to their 26th birthday year and for female pilots. The separate female competitions were established not to discriminate but to encourage women to take their flying further as many fail to do due to the demands of family and other duties. The FAI Sailplane Grand Prix, developed from an original idea to make our sport more accessible and physically visible to the general public while also simplifying the scoring system so spectators can see who has won, as that glider crosses the line in front of them, rather than wait hours for a complicated scoring system to work it out. This competition has a completely different type of start and also of scoring. A series of qualifying events is run in different countries over a period of around a year (with some leeway due to varying meteorological conditions and time zones) and the final features the top two from each qualifier so it is truly a test of champions. Entries are usually limited to 20, since everyone starts at the same time and may fly round and arrive very close together and very fast. Tasks may be routed over or close to the airfield more than once to give spectators the chance to see the race played out before their eyes and, during the time the gliders are away, tracking equipment carried in the gliders can send a real-time film of their positions and the territory onto giant screens or computers back at the field and on internet, truly involving the maximum number of people in the excitement. Types of task These may be speed tasks – round the classic triangle or other multi-leg course – or Assigned Area Tasks, in which the pilot chooses at what point to turn in an area as opposed to a single, imposed point. The advantage is that of being able to avoid areas of unfavourable weather while still scoring points. Cross the finish line, real or virtual, first! How is the winner defined? As the pilot who, over the period of a week’s competition, has amassed the highest number of points overall. This pilot is the FAI Sailplane Grand Prix World Champion. In classic championships, which may have 40 or more per class, a day winner can receive 1000 points. Under certain conditions, for example: where the quality of the day deteriorates to the point where too few pass a minimum distance, or alternatively, where the task proves to have been under-set with better-than-expected speeds, the leading score may be devalued according to a set protocol, with correspondingly reduced scores all down the class results list. In Grand Prix, the maximum possible day score is 10 points so some of the around 20 entrants, despite counting among the world’s best, may receive a zero score on some days.